The form of football we will be using to teach the kids how to play is the 6 – 9 man football format. It is a little different but you’ll see the awesome potential it has for teaching kids all the skills necessary to play the game effectively, safely and with a ton of fun. Since all players, including linemen are eligible as pass receivers, all players have a chance to catch a pass. Let me introduce you to the 6 (7-8) man football format and how its rules are slightly different to accommodate fewer players on the field. 6 man football originated in Nebraska in 1934 as a way for small rural schools to compete in the sport of football. The popularity of football was growing fast. A way had to be developed to provide the opportunity for small schools to participate in football. It is presently being played in 38 states and in several Canadian provinces. Texas has more than ninety schools playing 6 man football. In fact close to 100 players whose only high school football experience was of the 6 man format have made the NFL and CFL. The playing field is 90 yards long with 10-yard endzones, by 40 yards wide. One set of hash marks runs down the center of the field. Mid field is 45 yards from each goal line. To convert the Canadian regulation football field to the 6 man format, we simply establish one sideline as a sideline and establish the other on the opposite hash mark. The middle of the field is 3 yards from the hash marks between these sidelines. The goal lines are established at the 10-yard lines and the goal posts are at the rear of the endzone, similar to the American style field. This further minimizes the chance of injury when scrimmaging close to the endzone. The offense must advance the ball 15 yards in 4 downs to achieve a 1st down. In Lieu of Kickoffs, we will be scrimmaging at the receiving team’s 25-yard line, unless affected by penalty. Scrimmaging from the 25 will follow ALL scores, including single points on punts and missed FGs. Game opening scrimmage shall be decided by a flip of a coin. 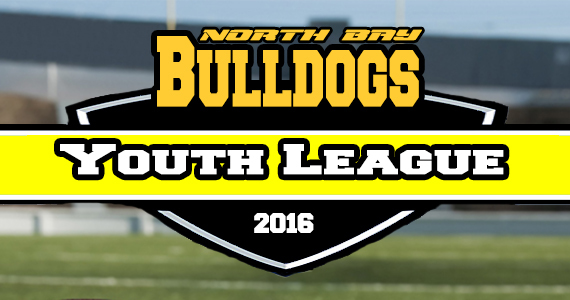 SPECIAL BULLDOGS YOUTH TACKLE FOOTBALL RULE: When a team is 15 or more points behind, immediately following any score, it may elect to scrimmage or defend on the ensuing scrimmage drive regardless of which team has just scored. 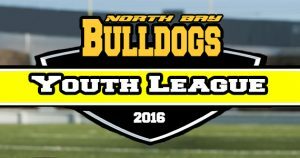 The Bulldogs Youth League Bantam Division will play 20-minute halves at which time the official will announce “Last 5 Plays” of the half. Those 5 plays will be played out to end the half of the game. The non-offending team on a penalty play will have the option to use up that play as one of the five or not count it. There will be a 5-minute break at half-time. The official can add time to the 20 minutes of straight time for injuries and other league approved interruptions. Time Outs only extend the time to get the next snap in and do not extend the 20 minute half. Often the best time to call a time out will be in the last 5 plays. We have 2 time-outs per half. Touchdowns count as 6 points. Touchdown conversions affected by running or passing scrimmage from the 5-yard line will count 1 point. Touchdown conversions affected by place kicking will count 2 points. (to encourage the development of kickers, holders and snappers). PATs will involve no defense. Only the snapper, holder and kicker shall be on the field with the ball snapped from a point 5 yards from the goal posts. Touchdown conversion attempts (single points) will be scrimmaged from the 5-yard line for single point attempt and 10-yard line for 2 point attempt. Field Goals will count 4 points. FGs shall involve no defense. The ball will be snapped from a point in front of the goal posts and 10 yards closer to the goal posts from the Line Of Scrimmage (LOS). Single points (rouges) may be scored as follows: If the ball is kicked and misses, but crosses the end line the kicking team shall score a single point. If the ball lands (hits the ground) in front of the goal posts, no points shall be awarded to the kicking team. In either case of a missed FG, the defending team shall scrimmage from their own 25-yard line. At least 3 offensive players shall be stationary and located on the line of scrimmage when the ball is snapped (4 for 7 and 8 man format). Waiver of the one (1) yard restraining zone (i.e. neutral zone is delineated by the football). HOWEVER, WE WILL COACH THE KIDS TO BE 1’ OFF THE LINE OF SCRIMMAGE. All players are eligible to catch forward passes. All other rules concerning forward and lateral passing apply. Unless the ball is kicked, punted or passed forward it may NOT be advanced across the line of scrimmage until an exchange has been made between the receiver of the snap (QB) and another player. This applies to direct snap, shot gun or a handed snap directly to a player immediately behind the center. This means that the QB generally cannot carry the ball across the line of scrimmage unless he first gives the ball to another player and then becomes a receiver of a legal forward pass, hand-off or lateral pass. Only players weighing 139 lbs or less are eligible to take lateral passes or handoffs from the QB behind the line of scrimmage. If a fumble occurs between the center and QB the play shall be blown dead immediately and ball replaced and the play replayed immediately, without a loss of down and without any huddle to a maximum of 1 time per half. This is the Mulligan rule providing for 1 free play for fumbled snap per half. Any fumble taking place on the offense’s side of the line of scrimmage shall be blown dead and considered recovered by the offense at the point where the ball hit the ground. The result of the play shall be the same as if the ball carrier was tackled at that point. All other fumbles may be advanced in the usual manner by the recovering team. To break a tie at the end of regular time the rules of Rule 1 Section 3, Article 6 of the Canadian Rule Book shall apply to a maximum of 2 extra periods. The initiating line of scrimmage for each series shall be the 35-yard line. If a tie remains after two extra periods, the game will end and be recorded as a tie. The losing team shall receive 1 point for an overtime loss in the standings, while the winner will receive 2 points. The defense in 6 man developmental football is permitted to rush only 4 players on any given play (also for 7 or 8 man format) with a maximum of 1 player rushing from an off LOS position. The defense may only blitz one LB or DB (player not aligned on the LOS) during any given play regardless of the number of D-Linemen they align on the LOS. If you align 2 DL, then you can only blitz one LB / DB, despite being permitted above to rush 4 players. Aligning 2 DL means you forfeit your right to rush 4 on that play. All defensive rushers but one must be declared by aligning on the LOS in the close line play area as a D-Lineman. A team may line up with 4 Defensive Linemen on any given play and attack the offensive backfield. All other players may attack after an exchange has taken place. Safety and fun for all participants is of the highest priority at this level. High Tackles where a player is taken down by holding or grabbing anywhere above the shoulders, shall be deemed unnecessary roughness. In the first half of the season officials will be encouraged to give one warning to offenders before penalizing. After the midway point in the season and in playoffs, high tackles will be regarded as unnecessary roughness. Any players penalized for unnecessary roughness a second time within a game will be told to sit out the rest of the half. Any stiff arm that appears to be deliberately driven to the face of an opponent shall be deemed unnecessary roughness. We need to discourage all hand work to the face or head of opponents. In the Bantam Level of play, those players weighing 140 lbs and over and playing offense shall be designated as linemen and shall not be permitted to take a hand-off or lateral pass and must be aligned as an offensive down lineman. This does not preclude their eligibility as pass receivers as everyone is eligible to receive a forward pass. Parents are not permitted to be spectators watching the game from the side of the players benches. All spectators must watch the game from the side opposite of the teams benches. Further, that there is a 5 yard no spectator buffer zone between the sideline and the first set of spectators. This is important for everyone’s safety reasons. The officials for these games will primarily be there to help the coaches teach the kids about the rules. On occasion you’ll see the official telling saying something to a coach like: “Jay, # 45 is holding when he is blocking, let him know k?”.